A hammer-wielding thug made off with a sum of cash after robbing a shop worker in Bathgate at the weekend. The incident happened at a shop in the town’s Millhaugh Lane at around 5.10pm on Saturday 9 February. Police said that a 64-year-old man was approached by a man who threatened him with hammer and stole a sum of cash. A spokeswoman for the force said inquiries are ongoing to establish how much was taken. The victim was thankfully uninjured during the incident and the suspect made off from the premises on foot. 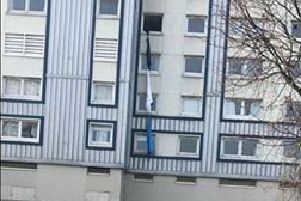 The suspect is described as a white man, aged in his 30s, around 5ft 10ins tall, wearing a dark coloured hooded top, dark coloured trousers and beige-coloured rigger boots. Officers are now appealing for witnesses and anyone who can help with ongoing inquiries is asked to come forward. Detective Constable Ally Urquhart, of Livingston CID, said: “This was an extremely frightening incident for the victim and those who were in the premises at the time it occurred. “We believe the man spoke with a local accent and could have visited the store previously as a customer. Those with information can contact Livingston CID via 101 and quote incident number 3110 of 9 February. Or make an anonymous report to Crimestoppers on 0800 555 111.